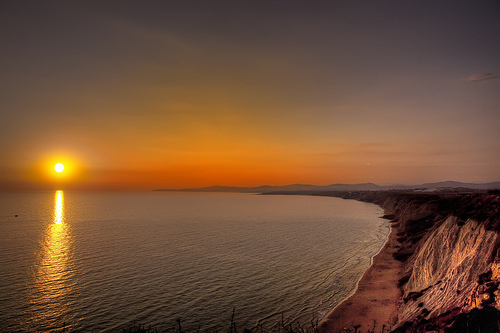 Sicilia is the largest island in Italy and the Mediterranean, and is located off the southernmost part of Italy (the ‘toe’) near Calabria, with which it shares some culinary, cultural, and linguistic similarities. 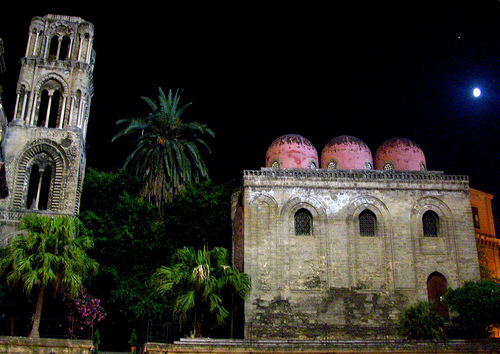 Historically, Sicilia was invaded and colonized by many civilizations from around the Mediterranean basin, including the Arabs, Greeks, Normans and Spanish. 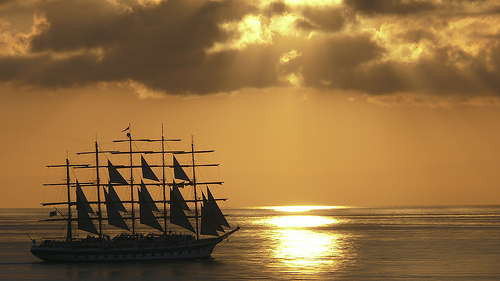 Each culture left a legacy on the island, whether in the form of architecture, culinary influence or agriculture. 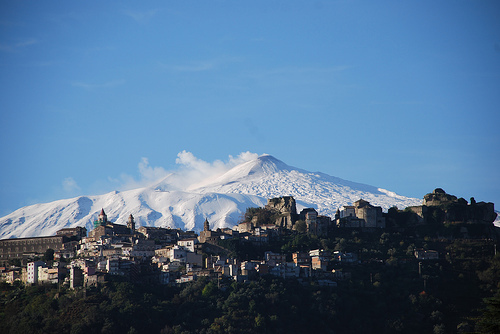 The Arabs, who ruled the island for 200 years from the 9th century, introduced irrigation, citrus fruits and are credited with also inventing sorbets using the snow from Mount Etna, Europe’s largest active volcano. Under the ancient Greeks and Romans, Sicilia was known for its fertile soils and favourable climate: its wheat fields were legendary. The summers are long and hot here, with very little rainfall. When the Scirocco wind blows in from nearby Africa, it carries sand from the Sahara desert, usually for three days at a time. 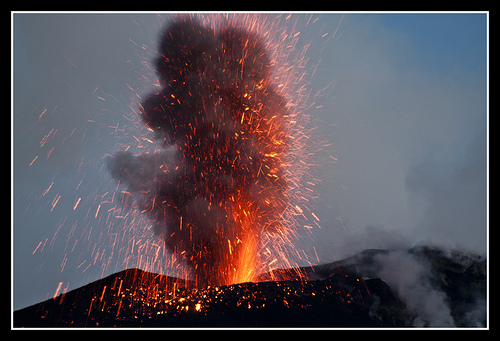 The soil around Etna is black from the volcanic minerals, and produces some of the best wines being made in Italy today as well as pistachios and almonds. 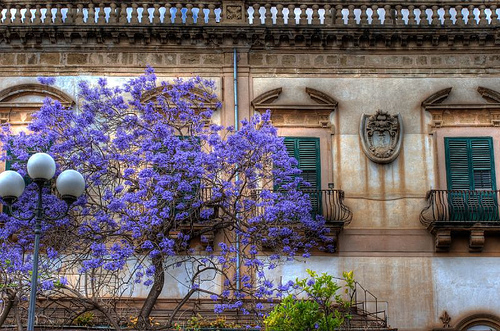 Sicilia is one of the most important grape-growing regions in Italy, most of which is made into wine and grape must. 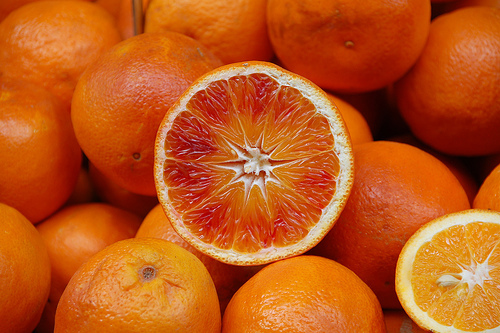 Sicilia is also a very important producer of citrus fruits – including blood oranges and lemons – and extra virgin olive oil. There is a large community of organic farmers in the region. The main industries are agriculture, tourism and fishing: (Mazara del Vallo has one of the largest fishing industries in Italy). 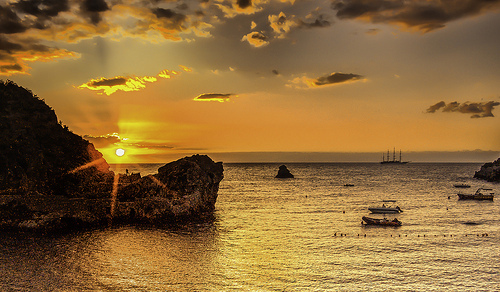 Sicilia is a magnificent island with a mix of hilly terrain and a long, beautiful coastline. For anyone interested in history, it offers some of the world’s finest ancient Greek temples and amphitheatres, as well as memorable Moorish, Norman and Baroque architecture. 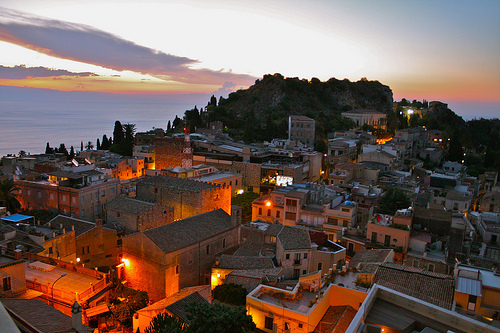 The most important cities to visit are: Palermo, Siracusa, Agrigento, Catania, Taormina, Marsala and Messina. 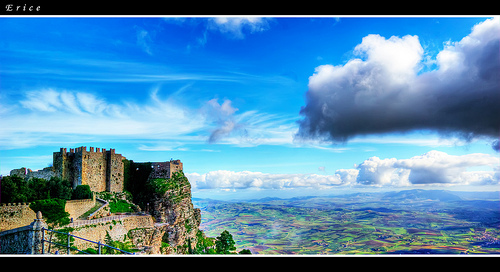 Sicilians are hospitable and proud, they are known for their extraordinary generosity and love of good food and family. 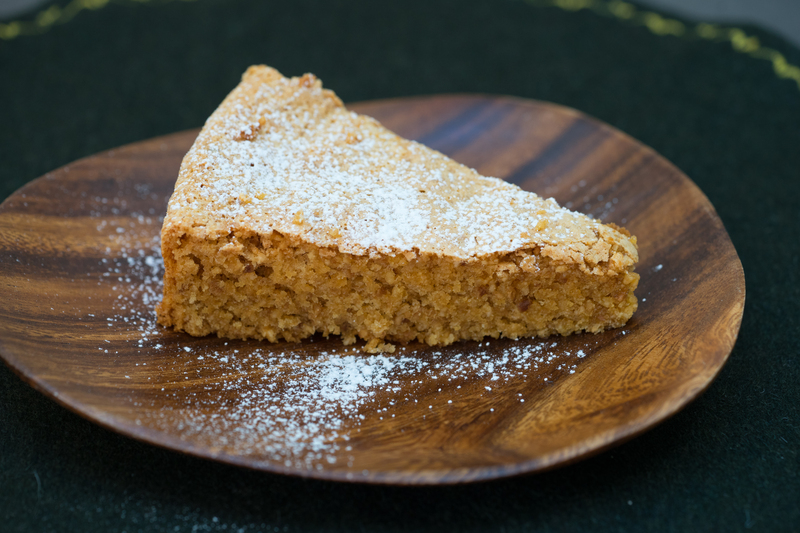 Among their most iconic dishes are couscous (a direct link to their Arab past), seafood pasta, vegetable cookery and very sweet desserts and pastries. Sweet and sour flavours are common in Sicilian cooking. 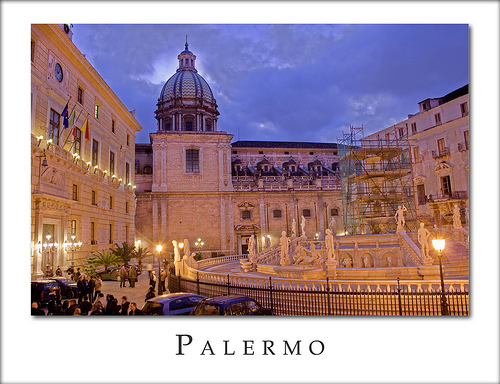 Palermo is one of Italy’s most important cities and was capital, with Napoli, of the Kingdom of the Two Sicilies. 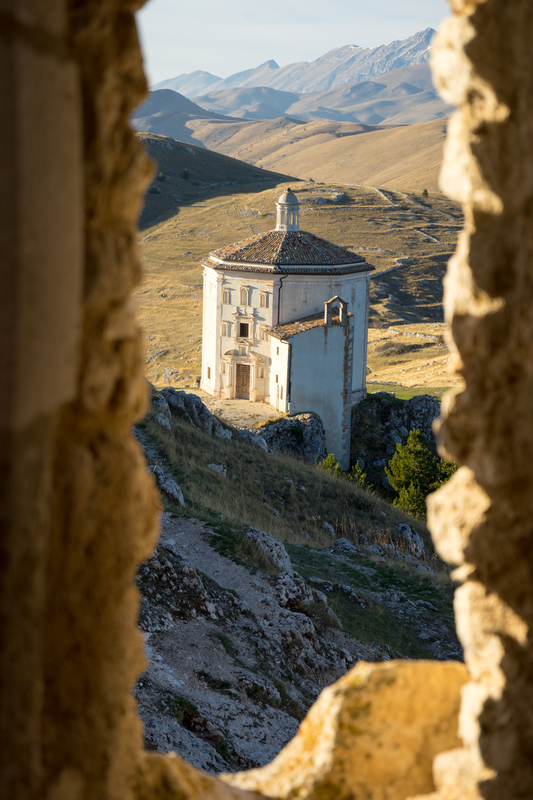 It is worth spending a few days there to visit many important cultural sites, including the Norman cathedral and the Baroque churches: l’Oratorio del Rosario di San Domenico, l’Oratorio del Rosario di Santa Cita and l’Oratorio di San Lorenzo. 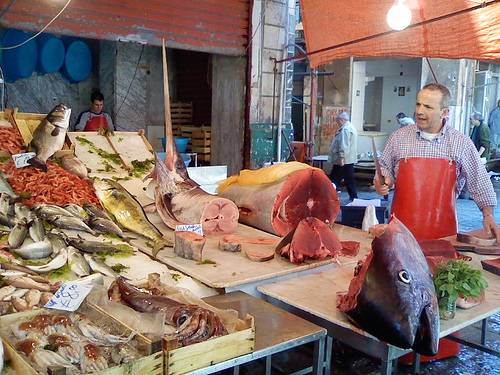 Palermo’s most interesting food markets today are Ballarò and Il Capo. 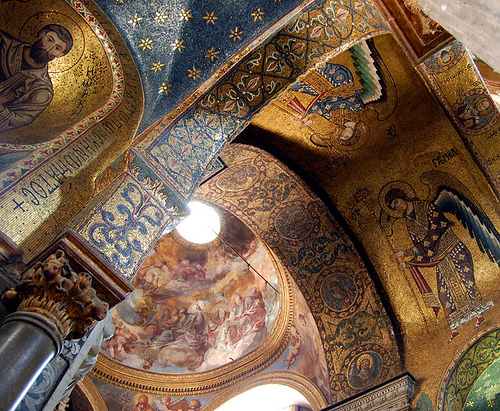 Not far from Palermo are the remarkable church of Monreale, with its Byzantine mosaics, and the small fishing port of Mondello to which the noble Palermo families would go in summer. The catacombs housing thousands of mummies (Catacombe dei Cappuccini) are also interesting. In the city centre, try the street food stands, pastry shops and gelaterie. Lemon and coffee granita are specialities as are fruit gelati such as mulberry (gelso) and jasmine flower (gelsomino). 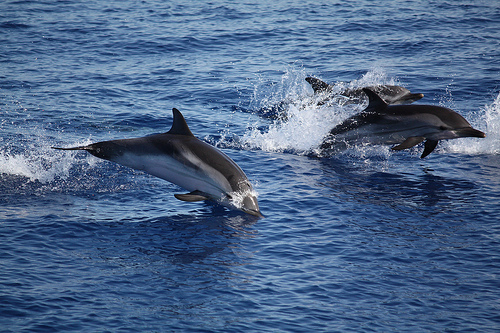 From Palermo you can take a boat to the island of Ustica, a volcanic island with a prehistoric village and volcanic island that is also a marine reserve, great for snorkelling or diving. 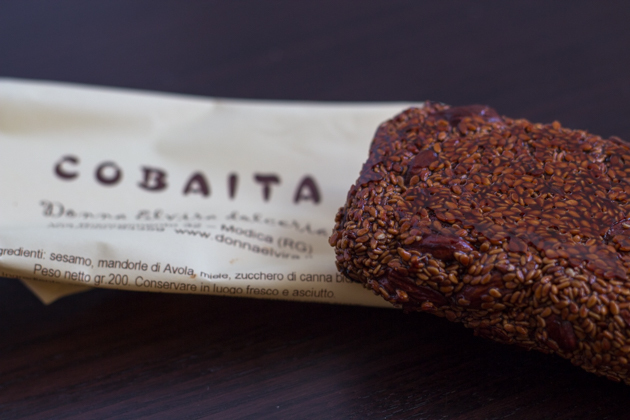 Ustica is famous for its tiny lentils. 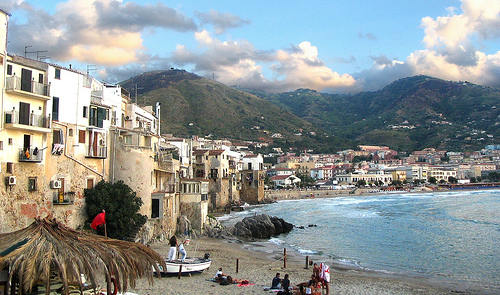 East of Palermo, on the road to Messina is Cefalù, a small fishing village on the coast that boasts a beautiful Duomo and fine mosaics. 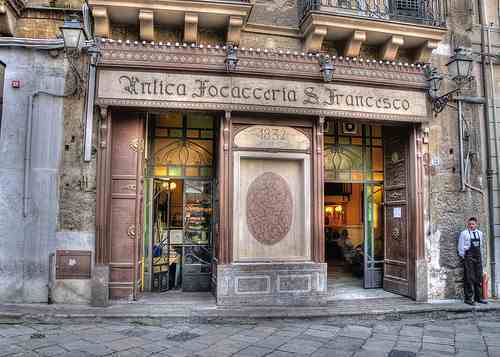 Antica Focacceria San Francesco S.A.S. 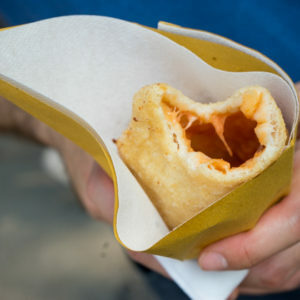 This restaurant specialises in the street food of Palermo, including, panino con la milza (spleen sandwich), panelle (chick-pea fritters) and arancini (fried rice balls). Food to take away or eat there. 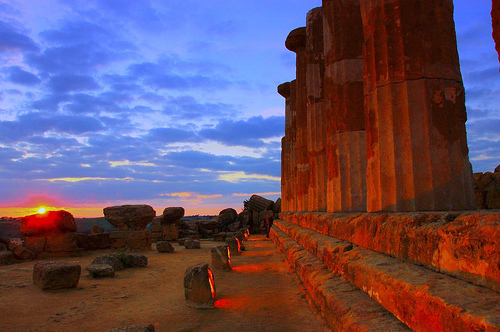 The hillside city of Agrigento faces out to sea and has a cluster of ancient Greek temples in what is known as the Valley of the Temples, or Valle dei Templi, now a UNESCO World Heritage Site. 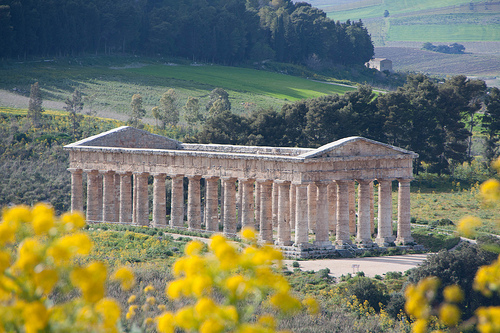 Other important Greek sites can be found at Segesta, Taormina, Siracusa and Selinunte. For those more interested in ancient Rome and its mosaics, a visit to the Roman villa at Piazza Armerina is a must; it too is a World Heritage Site. 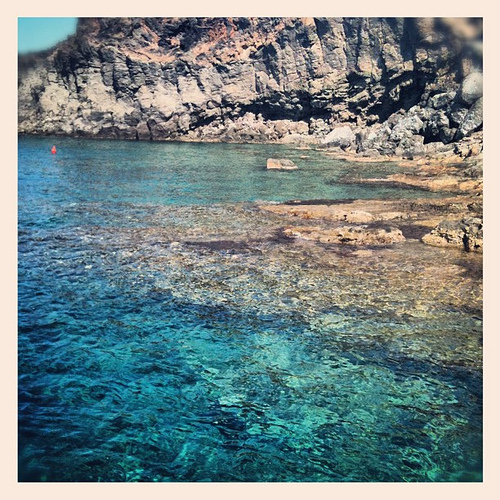 The Isole Eolie (the Aeolian Islands) are stunning and loved for their beautiful coastlines and hidden coves. The island of Vulcano comprises four volcanoes and the Porto di Levante beach, which is known for warm steam jets and the Great Crater. 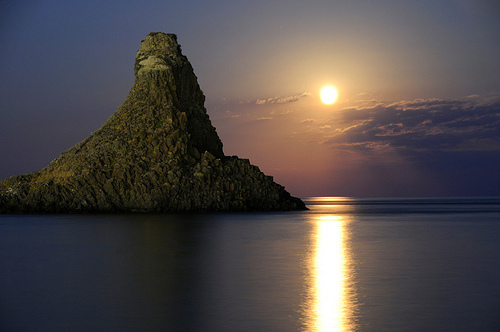 The island of Stromboli has black pebble beaches and an active volcanic crater that can be reached by foot. 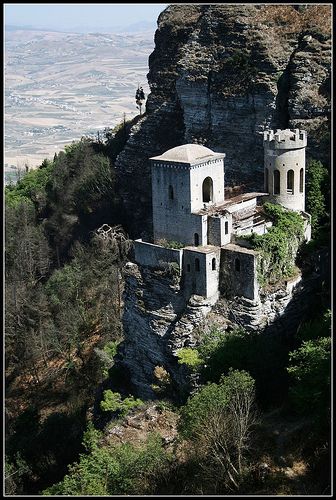 On the west side of Sicilia is the small town of Erice. It was founded by the Phoenicians but treasured by the Greeks; it sits high on a mountain overlooking Trapani and the sea. Nearby, the miniscule island of Mozia has a small museum that is worth taking the boat across the lagoon to if you are visiting the salt flats of Marsala. Marsala is a welcoming small city at the most westernly corner of the island and was an important city for the Phoenecians. 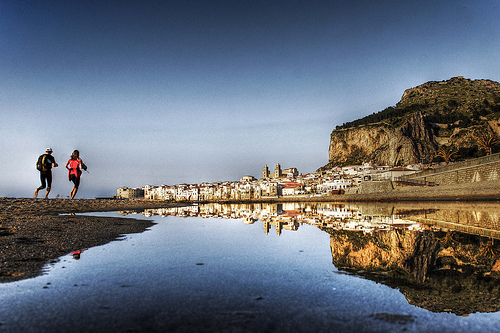 It is home to the great wine, Marsala, that in its highest form is one of the greatest Mediterranean aperitivi and after-dinner wines. (Never buy cheap, ‘flavoured’ Marsala wine). Marsala also has a recently restored marketplace in the town centre for local vegetable growers and fishermen.If you are interested in the history of wine, visit Cantine Florio in Marsala and Cantina Marco De Bartoli (just outside of the town) to get a taste of the great Marsala wine that was loved by Admiral Nelson. In the summer, it is lovely to spend a few days on the beach of San Vito Lo Capo and walk in the Zingaro Nature Reserve nearby. 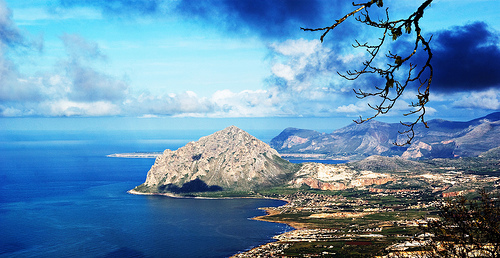 It is located between Trapani and Palermo. 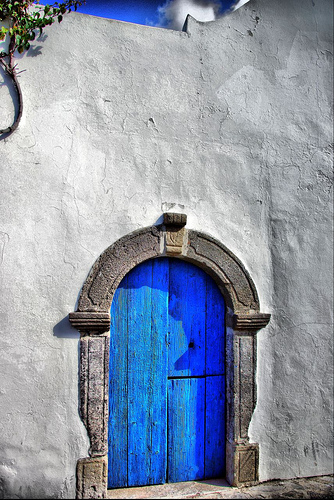 From Marsala, if you have a few days free, travel to the island of Pantelleria. 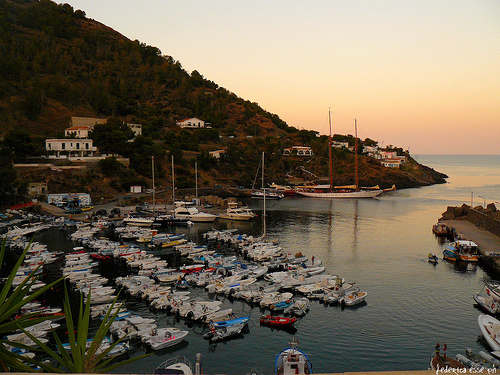 This black, volcanic island is quite primitive and is known as the ‘Black Pearl of the Mediterranean’. It is known too for its delicious small capers and the opulent dessert wine, Passito di Pantelleria, made from native Zibibbo grapes. 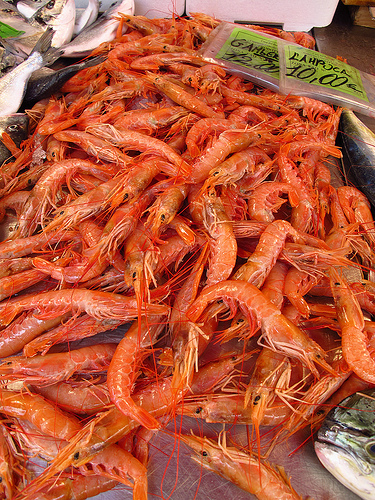 On the east side of Sicilia, Catania has one of the most lively food markets in Italy. 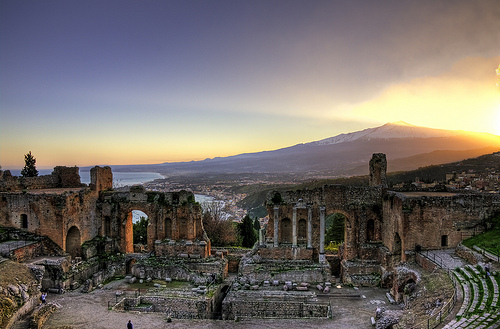 Siracusa and Taormina have important Greek amphitheatres that still host outdoor summer theatrical performances. 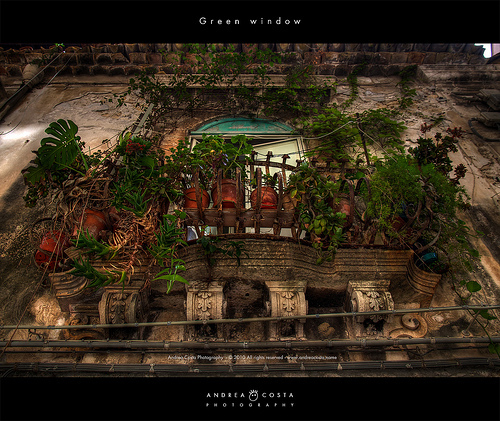 Siracusa, one of Sicilia’s most important cities, is located on a bay and has important medieval and Baroque architecture on the island of Ortigia. The archeological museum (Museo Archeologico Regionale Paolo Orsi) has many Greek and Syracusan artifacts. Other places of interest are the catacombs (Catacombe di San Giovanni), papyrus beds along the River Ciane (Fonte Ciane), and the artificial grotto (Latomia del Paradiso). 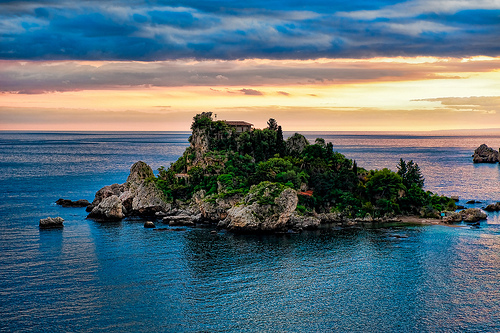 From picturesque Taormina, with its wide views of the sea, you can easily travel up to the slopes of the volcano, Mount Etna, and visit some of the important wineries on its northern face. What to bring home: olives, honey, frutta martorana (marzipan fruits), capers, caper berries, cubbaita / giuggiulena / cumpittu (sesame nougats), bottarga (salt-cured mullet or tuna roe), fine Marsala wine, ceramics from Caltagirone, Sciacca, and Santo Stefano di Camastra, coral jewellery from Trapani, dessert wine from Pantelleria, and candied citrus fruits. 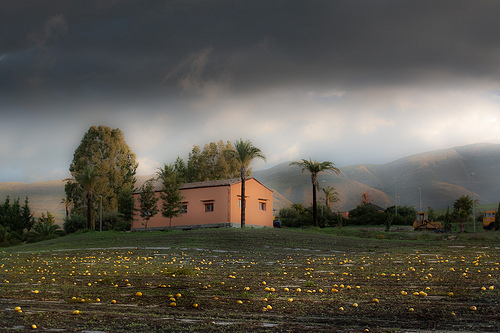 The island’s sun and fertile soils produce the intensely flavoured ingredients of Sicilia, from the iconic citrus fruits (especially blood oranges, lemons and mandarins) and tomatoes, to the artichokes, olives, almonds, pistachios and fico d’India (prickly pear or cactus fruit ) that thrive in the intense summer heat there. Grains and legumes are also cultivated. The sea offers a plethora of fresh seafood from the now over-fished tuna and swordfish to the abundant calamari, red shrimp (gambero rosso) and other Mediterranean fish. 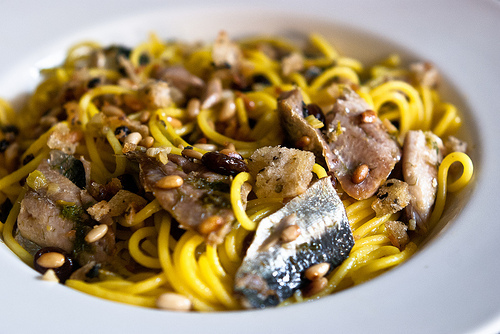 Local ingredients reflect the various peoples who historically influenced Sicilia. 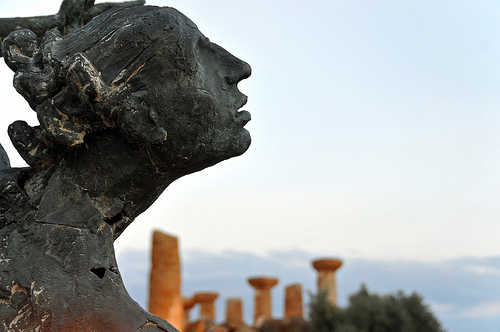 The Greeks introduced their love of wine and its culture. The Byzantines introduced sweet and sour food preparations. The Arabs brought citrus fruits, apricots, melons, sugar, rice, saffron, nutmeg, cloves, pepper, and cinnamon. The Spanish introduced cocoa, maize, and tomatoes. 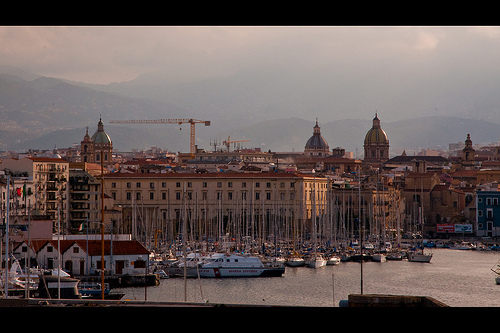 The Bourbons and Monzù (French chefs to Palermo’s aristocratic families) influenced the preparation of food. 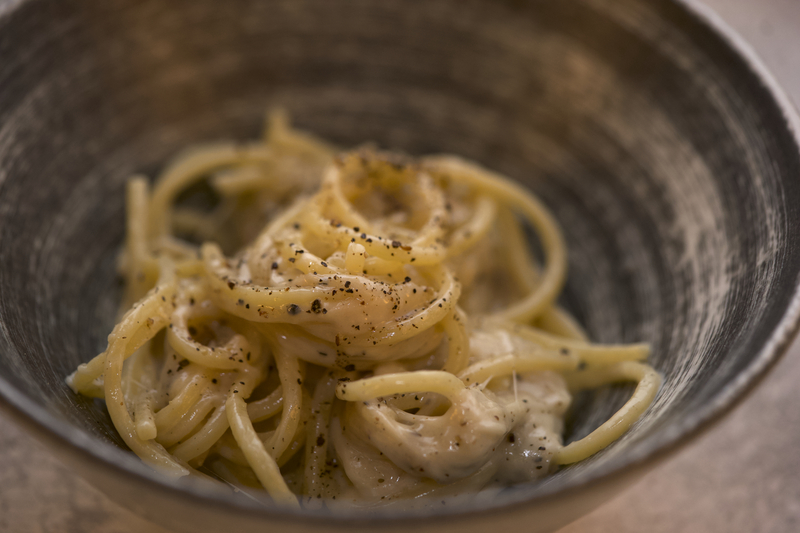 Flour and water pasta reigns in Sicilia and the most favoured varieties include maccheroni, vermicelli, taccuna (coloured with cuttlefish ink), corkscrew shaped maccaruna i casa / busiati / gnocculi, and the hollow cavatelli / cavatiddi / gnocculi / gnucchitti. Bread is still sometimes baked at home and meats and fish are typically roasted over wood-burning fires. 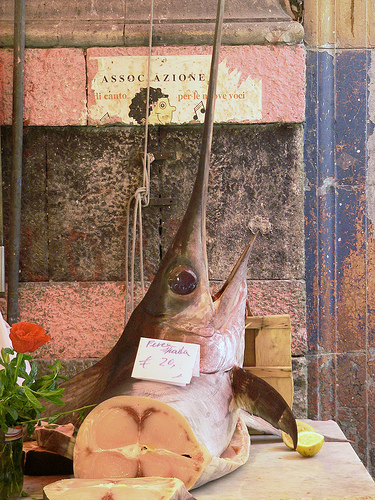 Other typical local ingredients include: grapes, peaches, chestnuts, hazelnuts, figs, raisins, cauliflower, broccoli, aubergine, squashes, capers, caper berries, honey, olive oil, lentils, broad beans, cicerchia (grass peas), bottarga (salt-cured mullet or tuna roe), seafood such as (prawns, langoustines, calamari, cernia di fondale (grouper), mormora (striped sea bream), rays, sarago (white sea bream), dentice (dentix), mussels, sardines, and cuttlefish), vinu cuottu (wine must syrup), asparagus, purslane, mustard, stockfish, baccalà (salt cod), cinnamon, sesame seeds, orange blossoms, jasmine, and anise. Sicilian food, particularly in the west and south where there was a stronger Arab influence, is very flavourful and has lots of contrasts such as sweet and savoury or sweet and sour. 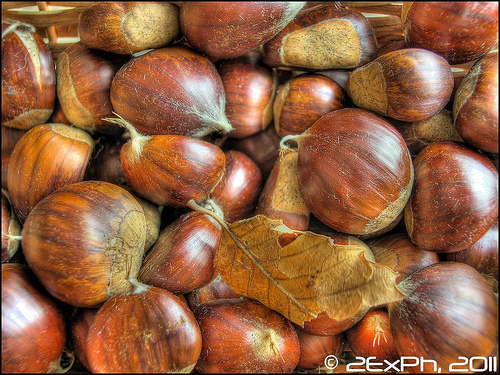 Caramelised onions substitute garlic as a flavouring and were introduced by the French. 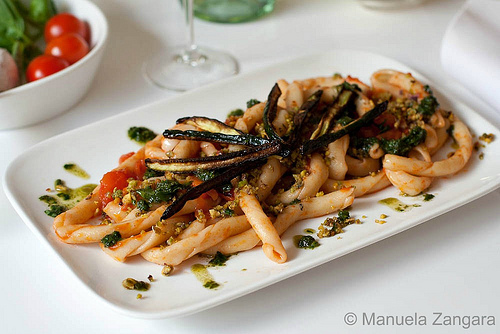 Pasta is loved in Sicilia but is made without eggs and is served with vegetables and fish rather than meat. 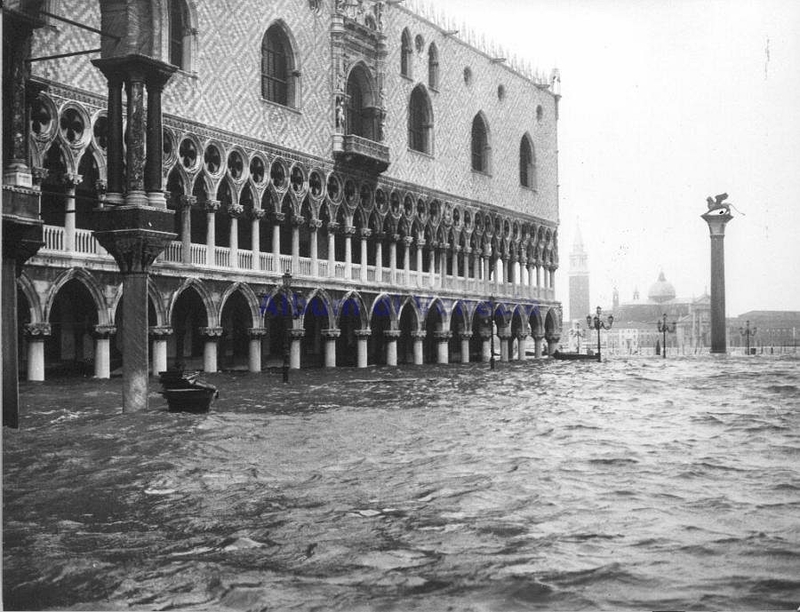 The most famous dishes are pasta alla Norma (pasta with aubergine and tomatoes), pasta con le sarde (pasta with sardines and wild fennel) and melanzane alla parmigiana (aubergine layered with tomato and Parmigiano-Reggiano cheese). 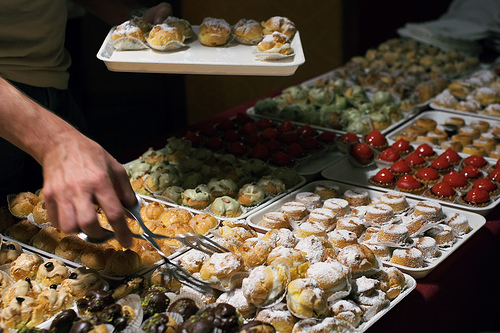 The Sicilians are very fond of street food and often eat snacks bought from street vendors. 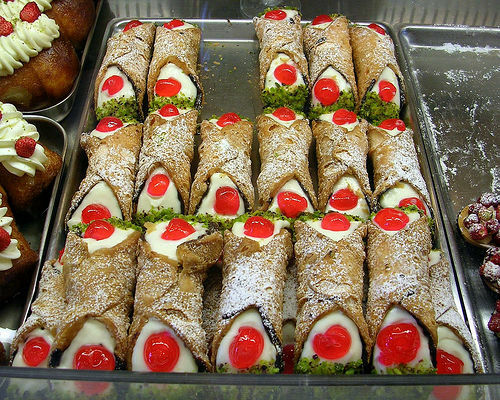 See Sicilian recipes here. 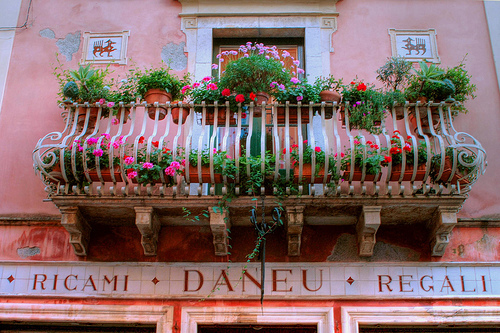 The influence of many cultural dominations is evident in Sicilian food. While there may be fewer soups in the Sicilian repertoire, pasta is ever popular, as is couscous (granular pasta made from durum wheat, a legacy of the Arabs), served with vegetables or fish. The art of pastry making was also learned from the Arabs and there are many classic Sicilian pastries: cannoli (fried pastry tubes filled with sweetened ricotta – preferably ewe’s milk ricotta – studded with candied fruit or chocolate), cassata siciliana (sponge cake topped with almond paste, filled with sweetened ricotta and decorated with candied fruit) that is always served at Easter, weddings, and christenings) and many types of doughnuts. 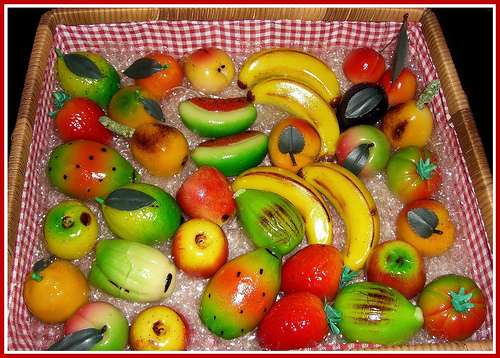 Ice cream making and confectionary were also learned from the Arabs and the Sicilians excel at fruit gelati. 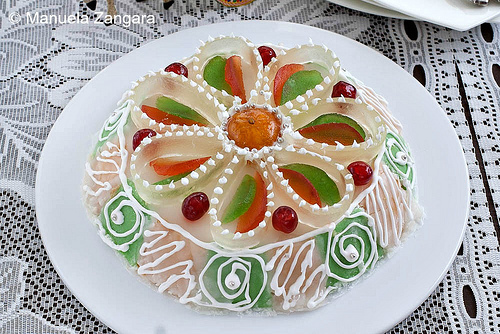 Sweets feature prominently in many religious and village festivals and each celebration has a special confectionary. 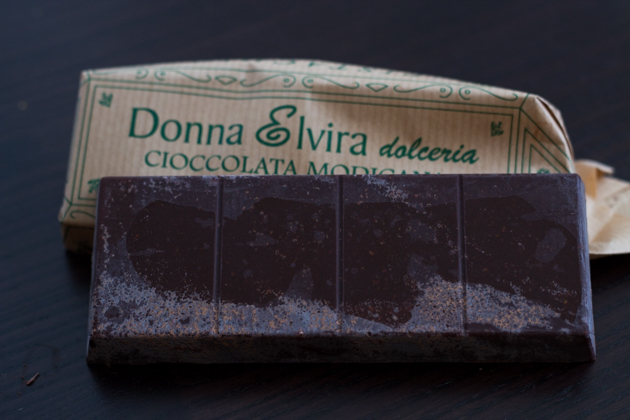 The Spanish brought a type of cold-conched chocolate to the island. The French influence to aristocratic Sicilian cuisine – due to the French chefs called Monzù (from the French, Monsieur) who worked in the noble households of Palermo is apparent in its timbales, bechamels and the force-meat dish, falso magro. 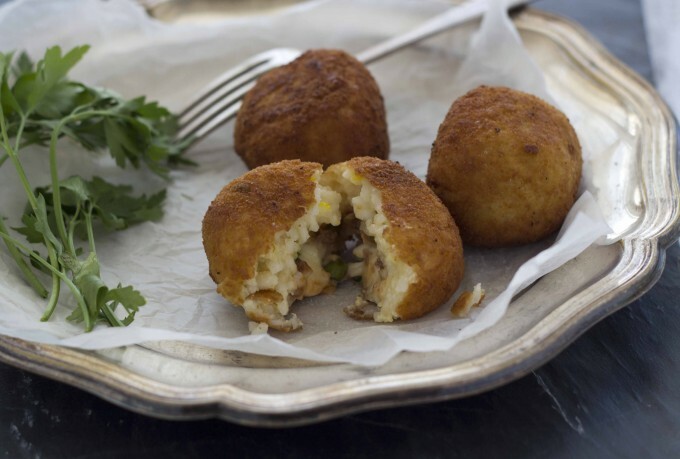 Favourite dishes from Sicilia include: arancini (deep-fried breaded rice balls), caponata (sweet and sour aubergine), cuscusu (couscous with fish or vegetables), braciole di spade (swordfish rolls) and pesce con salmoriglio (fish with a lemon, herb and garlic sauce). 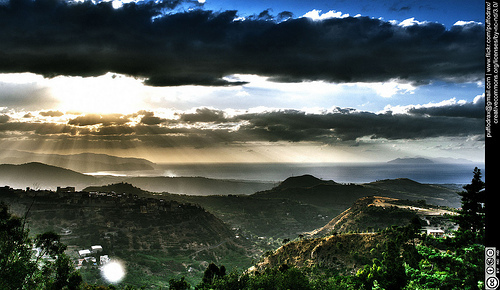 Sicilia is one of Italy’s most important wine-producing regions. Recently there has been global interest in some of the Sicilian native grape varieties, including the whites Grecanico, Grillo and Zibibbo, and the reds Nerello Mascalese and Nero d’Avola. Inzolia and Chardonnay are the most interesting white grape varietals in Sicilia. 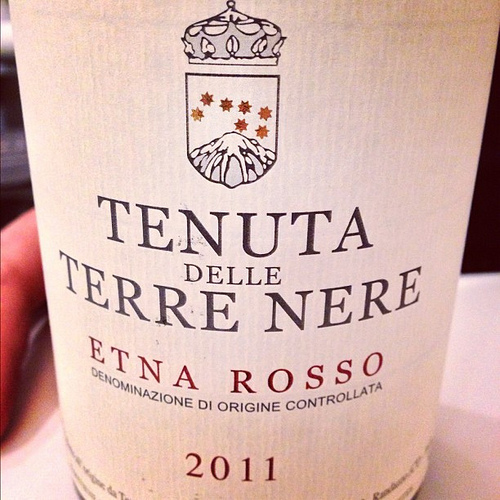 Important terroir labellings for both red and white wines are IGT Sicilia and Etna and for red wines also include Cerasuolo Vittoria and Faro. Look for producers of white wine such as Planeta, Tasca d’Almerita, Donnafugata, Benanti, Centopassi, and Firriato. 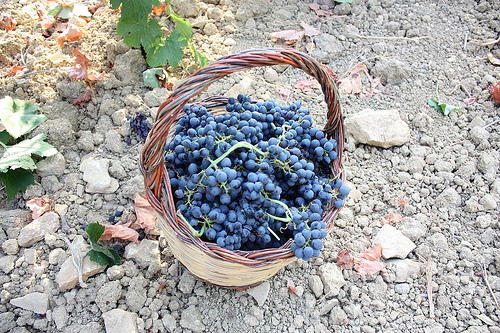 Excellent producers of red wine include Palari, Tasca d’Almerita, Terre Nere, COS, Donnafugata, Graci, Gulfi, Benanti, Centopassi, and Viticultori Associati Camicatti. 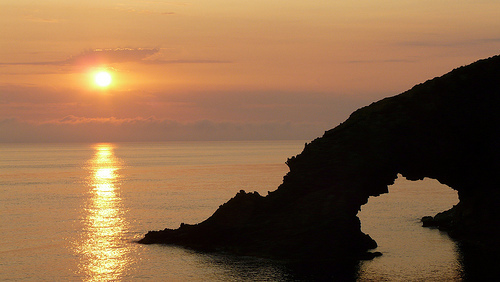 The finest pre-dinner and dessert wines are Marsala and Passito di Pantelleria. 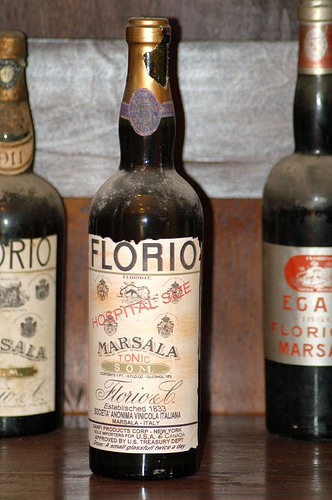 Try Marsala produced by Curatolo, Florio, or Pelligrino. 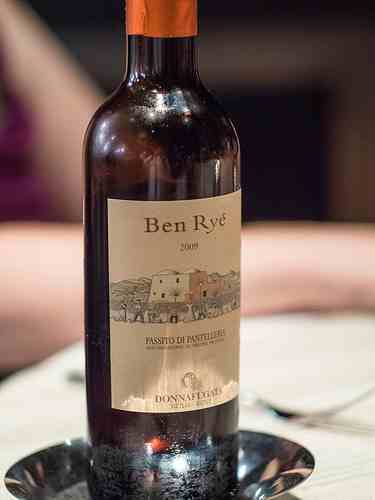 My favourite sweet wine in the world is Donnafugata’s Passito di Pantelleria. Ricotta Salata (ricotta that has been pressed, salted and dried. Used grated over many Sicilian pasta and vegetable dishes).